Imagine if your sun was tiny and red. Imagine if you could see other planets in the sky as large as the moon appears from Earth. Imagine if all the planets orbiting your star were roughly the same size as the planet you lived on. Now imagine that the world you’re imagining really exists and is in orbit around a star called TRAPPIST-1. This was the news shared by NASA this afternoon (depending where you are) in a press conference – a preprint of the accompanying journal paper can be downloaded here. Honestly, this is pretty big news. Firstly, we’ve never seen so many terrestrial planets crowded together in a single star system before. They are all roughly Earth sized, and three of them appear to be in the star’s habitable zone. What a find! And it’s only 39.1 light years away. Which is right in our back yard, astronomically speaking! I’m not going to rattle off the same thing in the press release, because it’s busily being talked about all across the internet right now. But I will do a little musing and point out a few cool things. 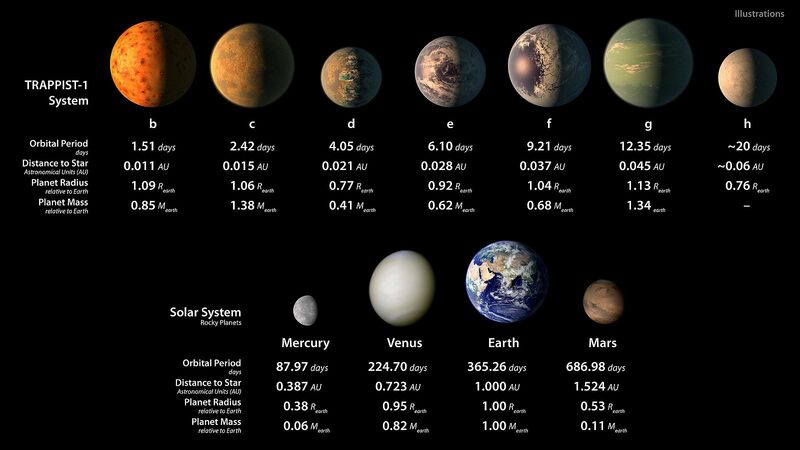 One interesting thing is that TRAPPIST-1 is tiny. Really tiny! It’s a class M8V ultracool red dwarf, which really is about as small as a star can get while still being a star. Much smaller and it wouldn’t be able to even fuse hydrogen. I’ve put it side by side with a few other familiar celestial objects in this image. As you can see, it’s a little bigger than Jupiter. It’s actually roughly the same size as HD189733b, a much studied hot jupiter, and noticeably smaller than Proxima, our friendly neighbourhood red dwarf. Lalande 21185 is on the larger end of the scale of red dwarfs, and is also one of the few you can actually see in the night sky (though you’ll need a dark sky to find it). Ultracool red dwarfs really are tiny, but they’re also extremely long lived. Quietly burning stellar embers which exemplify the old saying that slow and steady wins the race. Because these little stars don’t burn their fuel too quickly, and because they’re low enough in mass to be fully convective, they can burn for trillions of years. Long after the Sun exhausts the fuel in its core, flares into a red giant and then cools silently in the darkness, TRAPPIST-1 will still be burning, providing warmth for it’s little planetary entourage. Not much warmth, mind you. TRAPPIST-1’s handful of planets are huddling around their parent star as if it were campfire on a cold night. The entire star system would fit inside Mercury’s orbit and still have cavernous amounts of room to spare. So close are those planets, that they have years which pass by in mere Earth days. The shortest has a year which is just 1.5 Earth days long. The longest year length in the system is still less than a month. Of course, I say Earth days, because these planets don’t have days as such. They’re so close to their parent star that they’re certain to be tidally locked. The gravitational forces are sufficiently different that they cannot rotate at all. One side constantly faces the tiny red sun in the sky, and the other side constantly faces outwards towards the cold night. It’s quite likely that the night sides of these planets may be frozen in a permanent winter night, never gaining enough warmth to thaw. Half a planet of permanent Antarctica. On the side of the planet facing the star, it’s hard to say what might be. Some models suggest constant storms, driven by unflinching starlight. 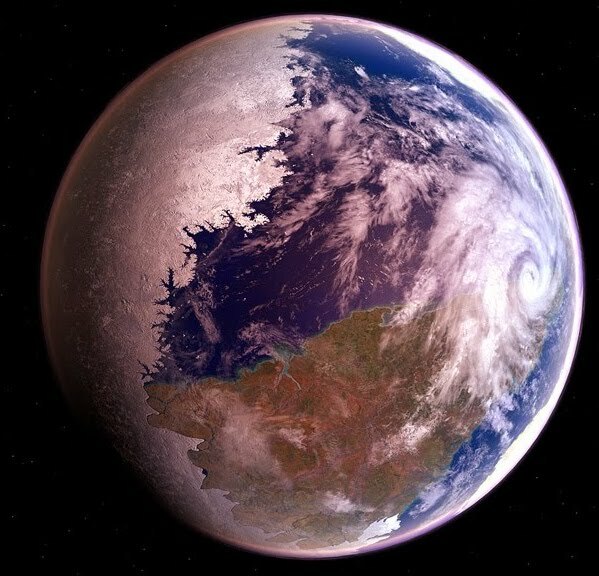 But in between the two extremes, planets like these could be quite comfortable. We have no idea what these planets may be like. But with a star that can keep them warm for trillions of years, if there’s even a remote possibility of life forming on any one of them, it’ll have all the time in the Universe to do it. Life can evolve at a leisurely pace, nurtured under a sun which will outlive most others in the galaxy. Of course, this is largely speculative. We don’t have the first idea how long a planet can continue to support life. For all we know, these planets don’t even have atmospheres. But the drive to find out is exciting. I’ve written about red dwarf planets on this blog several times before, as it happens. In 2008, I speculated about red dwarfs carrying miniature solar systems, and the possibility of life on them. In 2009, I wrote about the idea that red dwarf stars can have a very different chemistry to yellow stars like our own, and what implications there may be for astrobiology. And in 2010, I gleefully wrote about one of the first exoplanets to be found inside the habitable zone of a red dwarf. I revisited several of these ideas in 2013 in a summary article. Honestly, this is one of the best things about keeping track of these things for so long. After a while, you get to see things come to fruition. You see which ideas were right, which were wrong, and which remain uncertain. Anyway, there’s a lot to think about with this discovery. I have a feeling I may be writing about this tiny star system again in the near future. In the meantime, here’s an image of the planets we’ve just discovered. If you want a better view, you should click to embiggen it. Has anyone notified Han Solo that TRAPPIST-1 is almost *exactly* 12 parsecs away? This entry was posted in astronomy and tagged planets. Bookmark the permalink. 1 Response to A tiny red sun with a sky full of planets!